From its establishment in 1648 until its disbanding in 1793 after the French Revolution, the Académie Royale de Peinture et de Sculpture was the centre of the Parisian art world. Taking the reader behind the scenes of this elite bastion of French art theory, education, and practice, this engaging study uncovers the fascinating histories - official and unofficial - of that artistic community. 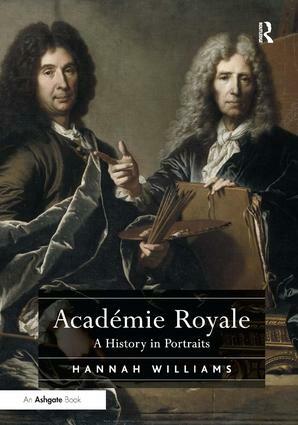 Through an innovative approach to portraits - their values, functions, and lives as objects - this book explores two faces of the Académie. Official portraits grant us insider access to institutional hierarchies, ideologies, rituals, customs, and everyday experiences in the Académie's Louvre apartments. Unofficial portraits in turn reveal hidden histories of artists' personal relationships: family networks, intimate friendships, and bitter rivalries. Drawing on both art-historical and anthropological frames of analysis, this book offers insightful interpretations of portraits read through and against documentary evidence from the archives to create a rich story of people, places, and objects. Theoretically informed, rigorously researched, and historically grounded, this book sheds new light on the inner workings of the Académie. Its discoveries and compelling narrative make an invaluable and accessible contribution to our understanding of this pre-eminent European institution and the social lives of artists in early modern Paris. "… with portraits as mediators, Hannah Williams draws her reader into the exclusive universe of Paris’s Royal Academy of Painting and Sculpture. She opens wide the great doors of this ancien régime institution and in a masterful way offers her audience the chance to experience and feel some aspect of the reality of this period and of the communal and institutional lives of the Academy’s members." "… a rigorous and original book… It focuses on the community of artists who constituted [the Academy], on the relationships and conflicts which shaped and formed this community, on their rites of passage, their gifts, their social, professional, family and friendship networks, and on the rivalries that played out in this prestigious place. All of this is attentively reconstructed through rich archival research and brilliant visual analysis of the portraits and self-portraits of the Academy’s members." Contents: Introduction: face-to-face with the Académie Royale. Part I The Official Face: An institutional image: portrait of the artist as an academician; Rituals of initiation: becoming and being in the Académie; On the wall: portraits, spaces, and everyday encounters at the Académie. Part II The Unofficial Face: Bloodlines: portraits of family; Reciprocal acts: portraits of friendship; Facing off: portraits of rivalry. Epilogue: the end of an institution; Appendices; Bibliography; Index. Hannah Williams is Junior Research Fellow in Art History at St John's College, University of Oxford.